My first HF allmode receiver. 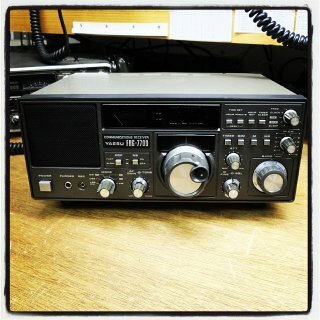 This one was responsible for getting back into hamradio. Used it to monitor weather fax and telex, listen to broadcast stations and most of all to hamradio QSO's. Made some repairs in it and also got my hand on 2 other one's (bought them for parts but got them back to live). My main FRG-7700 got his own active antenna and now used most of the time for monitoring propagation, weather fax and telex (perminant hooked up to my server with telex software decoder sofware). Main operations replaced by FT-897. More info on RigPix and Wikipedia. Repaired FRG7700 #1 was given to PD5WL for HF experiments reagarding propagations analysis. After years of service he sold it to a SWL listener. Repaired FRG7700 #2 was sold it to a SWL listener. Update 29 januari 2019: After years of excellent service my main FRG-7700 now has a new owner who is a dedicated SWL listerner.